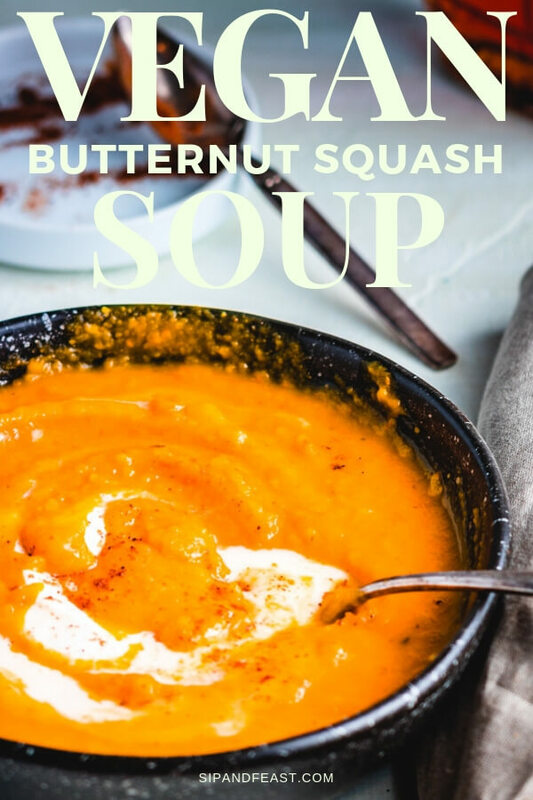 This vegan butternut squash soup is an easy, simple, delicious soup recipe! There’s only a few main ingredients like roasted butternut squash and carrots. Add some sauteed apples and a few spices and it’s ready to eat. I will show you step by step how to make it. Let me know how you like the new format with the numbered steps. I think it greatly enhances the directions but I am always open to suggestions. You will need 1 large or 2 medium butternut squash. Delicata squash could also be used or combined with the butternut. They both work really well for this recipe. 3 large carrots, and 2 apples are also needed. I prefer Granny Smith for this vegan butternut squash recipe, but any type of apple will be fine. The apples really improve the soups flavor! Olive oil, 4-5 cups of vegetable stock, maple syrup, salt, pepper, and nutmeg finish off the ingredient list. Obviously use a good quality maple syrup and not the artificial type. The syrup imparts such a nice sweetness to the soup – love it! 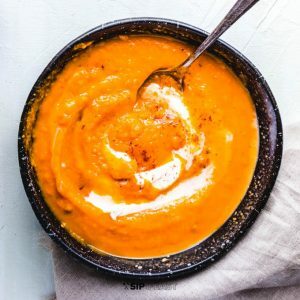 The soup is great with or without the addition of vegan sour cream, though it definitely looks better with a nice swirl of it before serving! Of course other types of squash will work well in this dish. My first choice would be Delicata, but Acorn squash would also be good. Any type of apple is fine. The nutmeg is optional, but I feel it gives such a great Fall flavor. Pumpkin pie spice would also be a nice touch. Roasting the butternut squash and carrots bring out so much flavor. So many great soups can be made by just roasting and blending the ingredients. Anyway, the squash and carrots need the roasting to soften them up for blending, so it pretty much is required. Remember cutting and roasting the squash pieces will speed up the time by about half, but either way is totally fine. This soup is a 2 out of 5 with 5 being the hardest. Only potential issues I foresee would be cutting the squash into pieces. Remember that step can be skipped with the longer roasting time option. The other issue is blending the soup. When dealing with hot liquids do not overfill in the blender and keep a towel and your hand on the top while blending. I think everyone has had a blender mishap at some point in their cooking career. If opting for the immersion blender, just keep it all the way down in the pot to avoid splattering. Before cutting preheat oven to 425f. 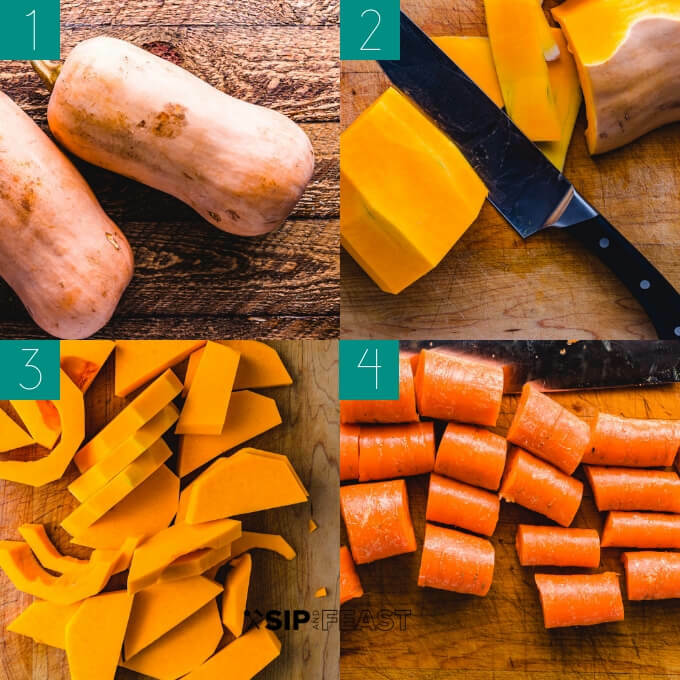 Cut the butternut squash with a sharp knife. Check out this Gimme Some Oven tutorial on how to do it safely. The cut up half disc pieces will take 30 minutes to roast. If you don’t want to cut them up in this manner and have more time just halve the squash and roast them in the oven for 60-75 minutes. Cut up the carrots for roasting as well. Place the cut up squash and carrots on a parchment paper lined baking sheet. Coat the squash and carrots with 2 Tablespoons of olive oil and season with salt and pepper. About 1/2 tsp of salt and pepper will be fine. Roast the carrots and squash in oven for 30 minutes. While the carrots and squash are roasting saute 2 diced granny smith apples in 2 Tbsp of olive oil in a stock pot. Saute on medium-low heat for 5-10 minutes to soften them up nicely. After 30 minutes check that the squash and carrots are fork tender. If not let them roast for another 5-10 minutes. When they are ready add them to the pot with the apples and stir together. Add 3 cups of vegetable stock to the pot, 1/4 cup of maple syrup, and the nutmeg. Stir together. I used an immersion blender to puree the vegan butternut squash soup. A regular blender will work even better – use either! If the soup is too thick add more of the vegetable stock and blend again. Really it’s that simple. 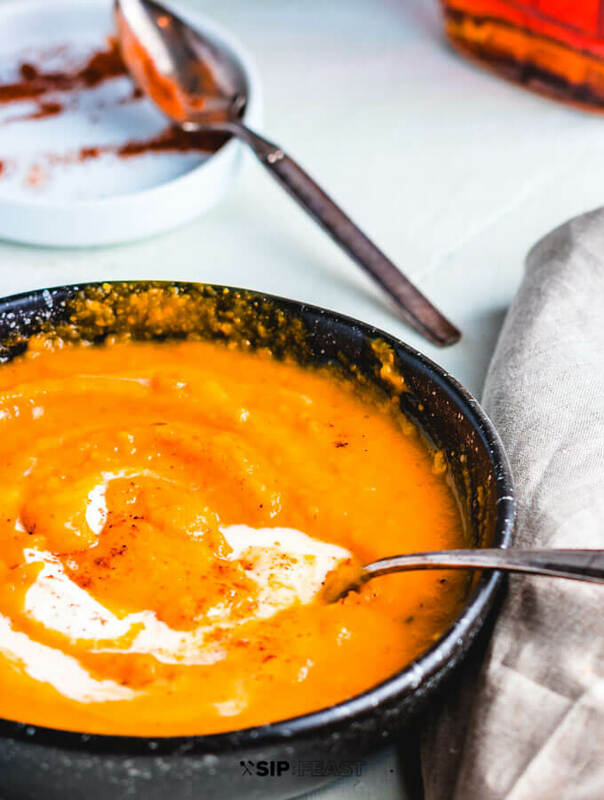 Let the butternut squash and carrot soup simmer for 30 minutes. Finally, before serving check the soup and add more salt and pepper to taste. Serve in bowls with a drizzle of vegan sour cream, maple syrup, and a pinch of nutmeg. 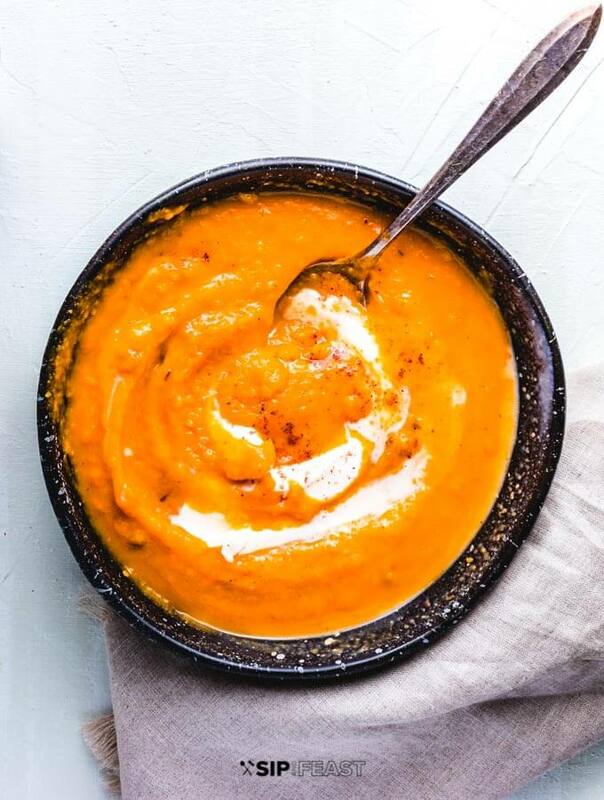 I love to serve this vegan butternut squash and carrot soup with some crusty bread. Placing some extra maple syrup, nutmeg, and vegan sour cream on the table is great for anyone who desires more of these garnishes. I personally love a nice swirl of the maple syrup! Cut Squash and carrots and toss with 2 Tbsp of olive oil and the salt and pepper. Place the carrots and squash on a parchment paper lined baking sheet and roast for 30-35 minutes at 425f. Optionally, just halve the squash and roast for 60-75 minutes, while still keeping the carrots roasting at 30-35 minutes. While roasting core and chop the 2 apples. Saute the apples in 2 Tbsp of olive oil in a large soup pot for 10 minutes on medium-low heat to soften them up. After 30 minutes add the roasted carrots and butternut squash to the pot. Also add 3 cups of vegetable stock, 1/4 cup of maple syrup, and the 1/4 tsp of nutmeg. Stir to combine. Blend the contents of the pot with either a traditional blender or an immersion blender. If soup is too thick add 1/2 cup of vegetable stock at a time to thin it out. Simmer the soup on medium-low for 30 minutes to fully incorporate all the flavors. Serve with a swirl of vegan sour cream, maple syrup, and a pinch of nutmeg. Enjoy! Any type of apple is fine. Garnish with more maple syrup and nutmeg if desired. 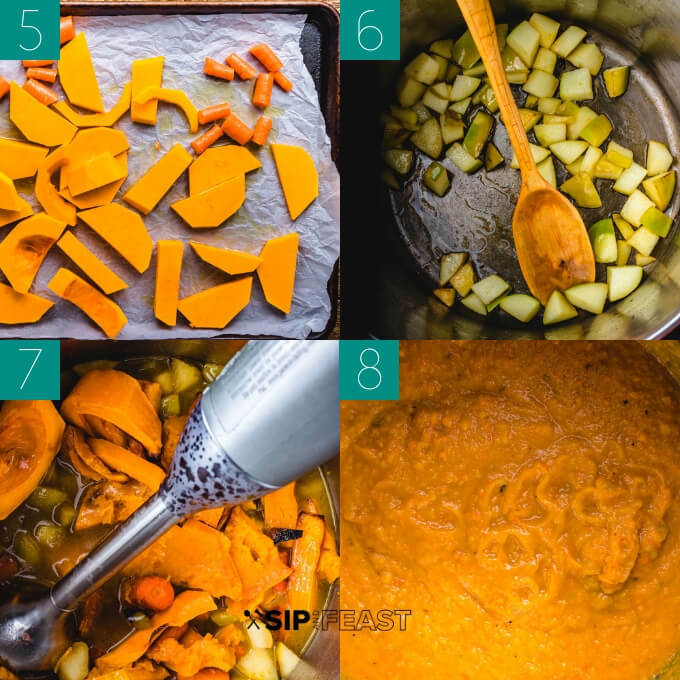 If you like this vegan roasted butternut squash soup recipe we would really appreciate it if you would share it on Instagram or Facebook using #sipandfeast. Hi Lynsey! Thanks for the compliment on the recipe and I appreciate the feedback on the process changes!